This page no longer applies to the Club Penguin Fanon Wiki's continuity, and has been archived for historical purposes. If you are interested in salvaging or utilizing portions of this page, contact an Administrator for guidance. To view the contents of this archive, select "Expand" below. Fire Sensei in the Fire Suit. Note the "the" in there. In the Fire Dojo teaching fire ninjas. Kaji Kojima (まとし火事) or Fire Sensei (火先生 in Ninja/Zhouese, meaning "fire teacher") helped Sensei create "Card-Jitsu: Fire". He is Sensei's long-lost brother. He had disappeared in 1999 and had been missing for 10 years. He was found a week before the announcement of Card-Jitsu: Fire. Fire Sensei's appearance looks much like his younger brother, Sensei. He has the same features except there is a scar on his face to represent the differences. The main difference is that Fire Sensei wears his fire robes. Fire Sensei usually stays in the Fire Dojo, and usually visits his home-land, Fire Island. Fire Sensei and his brother Sensei had lots of fun when they were kids and played a lot. He never saw his other brother, and was always stuck in the back-yard practising skills. He didn't have much friends, except for the neighbour's son - who practised with him. Fire Sensei's real name was "Seineas" (pronounced: Shaun-nay), and never used it much, only for formal uses. Everybody called him Fire, because of his attitude and looks. Penguins would laugh at him when he was practising his ninja-skills in the backyard - but he didn't care. At age five, Tsoi Hochstadt, found the boy and his other brothers, and swore to train them to become the future Senseis after having a vision of the Future. After almost two decades (20 years approx. ), Tsoi made Fire Sensei the world's first Fire Ninja, and Tsoi promised Fire that he would become Antarctica's second and most famous Fire Sensei. To his surprise, Tsoi was correct. When Fire Sensei played Sensei in regular Card Jitsu and Card Jitsu Fire, Sensei always lost, but he didn't mind. The cards were designed by the brothers themselves, but the creation was made by Tsoi and Li Hochstadt. Using ancient scrolls left behind by the Three Masters, he created a material that could absorb and utilize the energy of the Pectosphere at will and printed cards out of it. Then the two brothers would play Card-Battle. Soon the word spread around the neighbourhood that Fire and Sensei had created a cool card-game called Card-Battle. The neighbourhood had been rude to Fire, because they thought he was weird. The penguins that said that Fire was weird said sorry, and Fire forgave them all, and soon everyone in the neighbourhood were Fire and Sensei's friend. Many soon came to their backyard and asked if they could play. At the time, they had only made 14 cards between them, so they had to share. Soon almost everyday, penguins would come - about 5 to 6 - and ask if they could play. After business boomed, they bought mats and set them out as a field to play on, and soon printed more cards, creating almost over 100. They decided that things were "un-scheduled" and "organized", so they announced that public matches would only be on Fridays, and the every last Friday of the month, there would be official tournaments. The winner of the tournament every last Friday of the month would get a special-edition card as a prize. Card-Battle was very popular. They played a lot until they were grown up and in 1980, Fire Sensei went out on his first expedition alone. The game continued as the penguins that used to play when they were younger got their children to go and play the same game aswell, and soon Sensei was in his mid-20's and handled Card-Battle himself. He returned in 1990 and went out on his next one in November 1998. He said he would be back in January 1999, but that time had passed and Sensei was worried soon. He was reported missing and Sensei thought he would never see him again, but on Halloween 2009, he was seen watching "Night of the Living Sled 3" and then told everything to themselves. Fire Sensei learnt that Sensei had made Card-Battle into Card-Jitsu, and was very popular now. Sensei found out a lot from Fire Sensei. Fire was on the island the whole time, and knew what Card-Jitsu was and everything, but had never been to the Dojo or played it, so didn't know. Fire Sensei in his fire suit, sitting down at age 98. During the 1980s, Fire Sensei had decided to extend his journey and find out more about ninjas - which he had recently discovered. He took everything he needed. A mobile phone, money (foreign aswell) & the clothes on his back, and set off. Fire didn't actually know where he was going. All he knew was that he had to find out more. He talked to some travellers regularly during the trip, and later discovered of an island called Club Penguin - at the time it wasn't called that. On March 14, 1980, he set off on the latest ferry to Club Penguin Island. It took some months because it was a cheap ferry. By June-July, Fire Sensei had arrived on the island. The first place he looked was at the "Dock", where he asked some questions about the place and got a map of the place. He soon went to the "Coffee Shop" & "Town" for a drink. Then he went to the "Gift Shop" to by some new clothes. He found an old, broken rafting stick made out of brown, chipped wood, then climbed south towards the mountains. The hike took a while, and wouldn't of been able to climb if it wasn't for his stick. Fire Sensei would camp out on every cave he found, and set off the next dawn. It took weeks, almost a month or two, but stopped at an unusually shaped building, which was abandoned. Soon he realized that it was an extinct volcano, and he decided to explore inside. There, he found a huge lava fall contained within a gigantic cavern. Fire Sensei is immune to many hot things, so to him the lava wasn't that hot. The falls seemed to have been there for quite a while, and at one point they might have spurted lava out the vent he entered. There were two or three rooms. Penguins seemed to have lived there before, but not for a while. Fire Sensei decided to stay there for half-a-dozen years or so. Fire Sensei didn't pack much food, but had an unusual digestive system, and would eat the volcano rock by dipping it in the lava and chewing on it. He also ate by melting the snow with some wood & lava, which - to him - tasted especially nice. In his free time, Fire Sensei would practise his ninja skills again, and realized that he had packed his Card-Battle cards, and would play them... with himself. An example of the start of a tournament. In the decade, Fire Sensei had learned so much. By tactics & skill, he was a pro. In those 10 years, Fire Sensei made more cards - it is still unknown how - and most of them were fire-based. Fire Sensei knew what "Sensei" meant, and knew it was a name too, so decided to call himself the "Fire Sensei". After in 1989, he started a thing called "Fire Ninjas", but kept it to himself for the time being. He returned home, where he talked nothing of his so-far adventure. He lived his normal life for another year, and started doing the same thing what his younger brother was doing... handing Card-Battle and teaching little chicks. Then in November 1998 he set off, again with no information or status. He went back to the volcano, and started stretching his discovery. He didn't return in January 1999 as he said. "There is a new craze called Fire Ninjas in the mountains up in the volcano. Come and experience adventures that you've never experienced before. And keep it a secret"
Everybody did as told, and nobody told the local newspaper or any reporter. On January 19, 2000, 20 penguins had come to the volcano and started their training. They got told everything that they needed to know. Fire Sensei had stolen a card-making machine from a local shop and creating Card-Battle cards with them... and all of them were fire-cards. By the timetable, the subjects a Fire Ninja had were "Card-Skills" - where the ninjas would play Card-Battle, "Ninja Tactic" - where they all practised their ninja misc. "Physical Battle" - where they would pair up and battle each-other, and "Tournaments" - where they would face each-other for real and battle. Another lesson is the Weekly Test, where Fire Sensei tested the Fire Ninjas on everything they learnt in the week. This could be demonstrating something, showing a move or giving answers. Fire Ninjas would also have break-time, where they would all go outside the volcano, and hang around the place, possibly get some food from the hall, play or chat. The numbers below the subject title are the room code. They can be decoded and stand for things. Fire Sensei about to start a lesson. FN:P-53 - FIRE NINJA:PHYSICAL-ROOM NO. 53 (note there are not 52 other rooms). They would start at a certain level. These levels were called "fire numbers", and since 2003, every year new students would be admitted into the volcano. The ones that start their first year are "Fire No. 1's". The Fire Ninjas who have spent 2 years being Fire Ninjas would be "Fire No. 2's" and so on. By 2005, there were almost 70 students, and there was soon enough not enough room. In 2005, Fire Sensei decided to change the dorm-rooms into their fire numbers for more organized results. The penguins in their dorm would stay the same, but more rooms were made. There were 2-5 penguins in each dorm-room, and soon there were just enough. Fire Sensei stopped more admissions and kept the amount. Then in 2007, he decided to give a holiday to them all. Many objected to the result, but Fire Sensei didn't change his mind. He needed to get things more sorted. Fire Ninjas were still not official - meaning that it wasn't released to the island, and by then Club Penguin had become Club Penguin, and was especially popular since 2007, and still no reporters or newspapers knew about Fire Ninjas. But since Fire Sensei closed down the school, everybody kept low, and were forbidden to wear their uniforms in public - and nobody ever did, for the sake of their master. Sensei had come to Club Penguin a long time ago, about near the late 1990s. When Sensei arrived, he first went up to the mountains. He saw a place. Sensei recognised it, and had built the place he was looking at... the Dojo. Sensei had created the Dojo for his and his brother's Card-Battle came. He found a volcano - the same one Fire Sensei was in - and saw penguins with Card-Battle cards up there. He asked them where they got them from, and they told them about the Card-Battle game, and about Fire Sensei, his school & everything, but the only thing that Sensei didn't know that Fire Sensei was inside the volcano. Sensei knew that Fire Sensei was here, but never found him, and roamed around the mountains for the years. He went home and then in August 2008, Sensei had found out saw Club Penguin in a local newspaper article, and there was a picture of penguins at the "Ski Village". He looked at it, and in the corner of the picture he saw two penguins with a card. Fire Sensei's little brother realized what card that was. It was his and Fire Sensei's copy of a Card-Battle card. He left home to go to Club Penguin again. 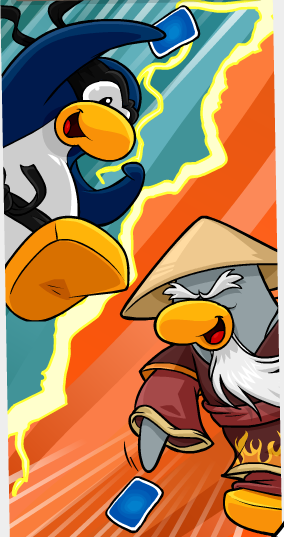 And then he went to the Dojo to start Card-Battle again... this time with a re-named name, now called Card-Jitsu. Sensei told the news reporters and everyone, and said that the game would release on November 17 and will be in the Dojo. Nobody ever realised that Card-Jitsu was the same as Card-Battle. Fire Sensei then found out that his brother, Sensei, had re-modelled their Card-Battle game into "Card-Jitsu". Fire Sensei was proud of his little brother, and decided to keep a low profile and start over the tradition of Fire Ninjas again. He called in every Fire Ninja he trained, and told them that he was re-enacting Fire Ninjas, and the volcano in which they trained in would become... the Fire Dojo. The golden fire amulet. The original one made by Fire Sensei himself. Fire Sensei then started training Fire Ninjas again until September 2009, when a complex series of events caused Diamond Falls to awake again. Lava burst through a vent near the Fire Dojo, and soon a steep cinder cone volcano formed. The government, in an effort to keep the public calm, gave Sensei and Fire Sensei a grant to publicize their latest project: Card-Jitsu Fire. Everyone finally learned that the two were brothers, and a new ninja craze swept the island. Him and his brother, Sensei are twins and it is hard to tell them apart. His brother likes tea, but he likes cake more than anything (except training fire ninjas). He keeps the Fire Emerald, one of the five Power Emeralds. Fire Sensei is 99, one year older than his younger brother, Sensei. They are described as twins, but are not completely twins. Sensei speaks in "haiku", though Fire Sensei doesn't, but uses stronger vocabulary and talks for formal & wiser - because he is older, by one year. He hates Swiss Ninja because Swiss Ninja is a Water Ninja, but he still likes to challenge him, as seen in this picture. Speeddasher has a lot of respect for him. PinkroomX has a crush on him. He was the one who gave Tails6000 his Fire Tails form.